J&K BPEE CET (जम्मू कश्मीर इंजीनियरिंग प्रवेश परीक्षा) 2018: J&K Board of Professional Entrance Examination conducts the J&K BPEE Common Entrance Test 2018 for enrolling the new admissions in various engineering colleges of Jammu and Kashmir state. Only the candidates meeting the eligibility norms in all the aspects are invited to register themselves online by submitting J&K BPEE CET Application Form 2018 on or before the last date, i.e. in March 2018. After the successful submission of online applications, candidates have to appear in the entrance exam in May 2018. The seats will be allotted to the candidates in various engineering colleges in Jammu and Kashmir on the basis of choices filled in the counseling form and the marks obtained in the entrance exam. For taking admission into the J&K state’s engineering colleges, all students need to fill the application form of J&K Engineering Entrance Exam 2018. Application form of J&K BPEE CET is available online at JKBOPEE official website from February 2018 and the eligible candidates are invited to register themselves online by submitting the J&K BPEE Common Entrance Test Application Form 2018 on or before March 2018. The online entrance exam will be conducted in May 2018 at various exam centers all across the state. Steps to Apply Online for J&K BPEE CET 2018. Aspirants need to visit the official site of J&K BPEE CET exam 2018. Fill the application form and attach all required documents (with photo and signature of applicant). Recheck the application form carefully and click on the submit key. Pay the application fee otherwise, the application will be discarded. All applicants need to pay Rs. 800/- fees of the application form 2018. Students can pay this fee by online payment mode (by credit card or debit card). By the HDFC bank challan can pay the fees of the application fees. Candidates can directly deposit the fees into BOPEE Account. This exam for the undergraduate students who want to take admission into the B.tech courses at J&K state. The applicant should be from J&K state. The minimum aggregate passing marks should be 50% in 12th class board exam. In this exam, the questions will be asked from the 11th & 12th board exam syllabus. The questions will be asked to form the physics, Chemistry, Maths subjects only. For JK BPEE CET exam 2018 there will be 2 papers of the exam. The first paper will be Physics and Chemistry subjects. The second paper will be Maths subject only. All candidates need to check the sample paper of J&K BPEE CET for getting aware of the type of questions that are asked in the examination. Candidates must make it sure that they are following the right path to prepare themselves for the exam. By going through the model test papers provided by us, the candidates will be able to analyze the weight of questions that are asked from a variety of sections of Physics, Chemistry, and Maths. By following the J&K BPEE CET Previous Year Papers, candidates can make a study plan of the exam according to the pattern of the upcoming exam. All the applicants who are going to appear in the entrance exam will be able to download their JK BPEE CET 2018 Admit Card in the 02nd week of May 2018 by following the official website of JKBOPEE. Admit cards will be provided before the 10 to 15 days of the exam and the exam will be conducted in May 2018. It is compulsory to carry the admit card in the examination hall, without permission letter, no applicant will be allowed to appear in the examination. J&K Engineering Entrance Exam 2018 will be conducted in May 2018 at various exam centers all across the state. After the successful conduction of the exam, candidates will be able to check the J&K BPEE Common Entrance Test Result 2018 by the end of June 2018. After the declaration of the J&K BPEE CET Result 2018, the selected candidates who qualify the cutoff will be called to register themselves for J&K Engineering Entrance Exam Counselling 2018 in June-July. The seats will be allotted to the candidates as per the choices filled in the counseling form and the J&K BPEE CET Merit List 2018. 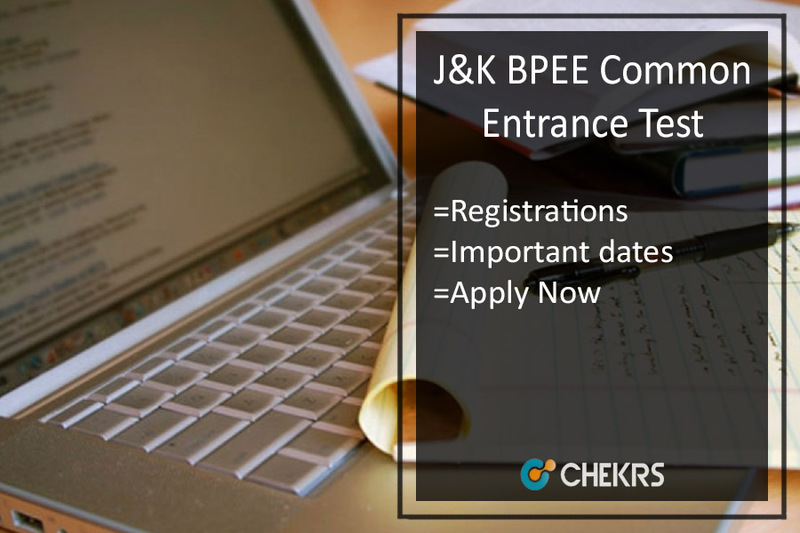 For any type of queries concerning the J&K BPEE Common Entrance Test 2018, you are invited to contact us by commenting at the end of the post, we will respond you as soon as possible with the most optimal solutions.